Midnight’s Children, Salman Rushdie, Turtleback Books, 1991 (c1981), ISBN 9780613173742, 544pp. This book should have been a favorite of mine, as it combines the overall concept of a small, misunderstood group of people with extraspecial powers (a la X-Men in the comics) with the style of Latin American magic realists (a la Jorge Luis Borges or Gabriel Garcia Marques) and the literary theme of trying to make one thing match another (in this case, the life of Saleem Sinai with the history of India itself). But I found it much too slow, repetitive, and obtuse. Perhaps I needed an annotated version, so that I could appreciate it more? This is indeed very disappointing to me, as I think Rushdie’s style of mixing the highbrow literary art with pop culture references and scatalogical content a refreshing change. I like it a lot more than literary pretension like that of New Yorker darling Matt Klam. The problem really came down to the way that the style came together in that, while I found the story and the theme elements fascinating, I thought the sentences way too bloated, where entire sentences and paragraphs could easily have been cut. This is not to mention the repitition of earlier events in an underscore of the themes, that might have been useful if you were the type of reader who couldn’t connect the dots the first time the lines were drawn. I know I’m going to be in the minority on this one, for not only has Midnight’s Children already won major awards, it’s been virtually canonized by the Booker people as the best of the Bookers. Oh, well. I’ll chalk yet another one up to the vagaries of taste. 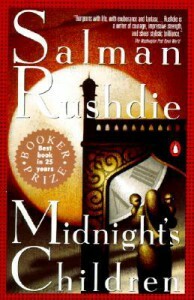 It’s not that I don’t think Rushdie can’t write, but that his writing just doesn’t work for me.